The box the 50 EUR kit comes in, isn't the regular cardboard box, but a slipcase. 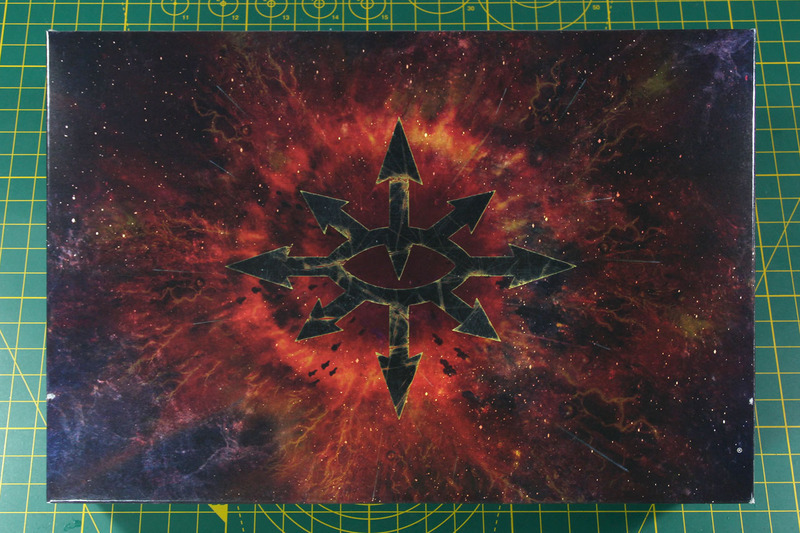 Inside the "regular" 40k designed sleeve is a special printed box, covering the eye of Horus / Chaos and an artwork of Abaddon himself. 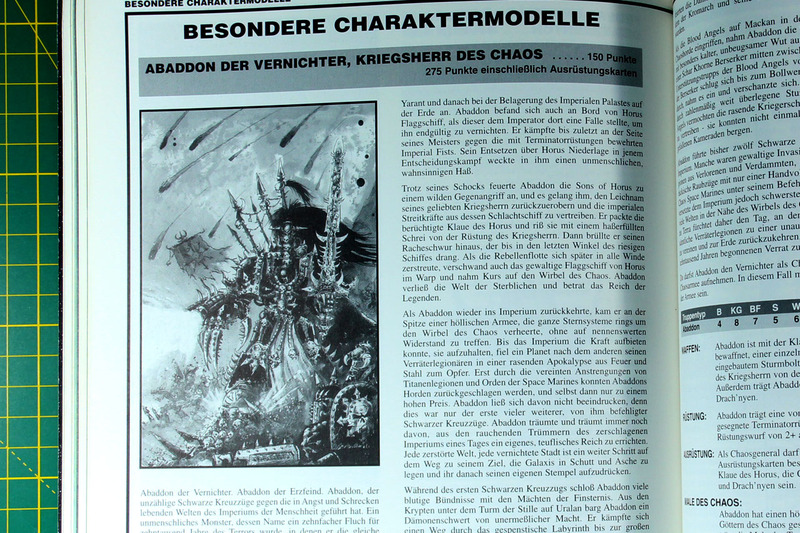 Abaddon was introduced with the 2nd edition of Warhammer 40k, and that very prominently. 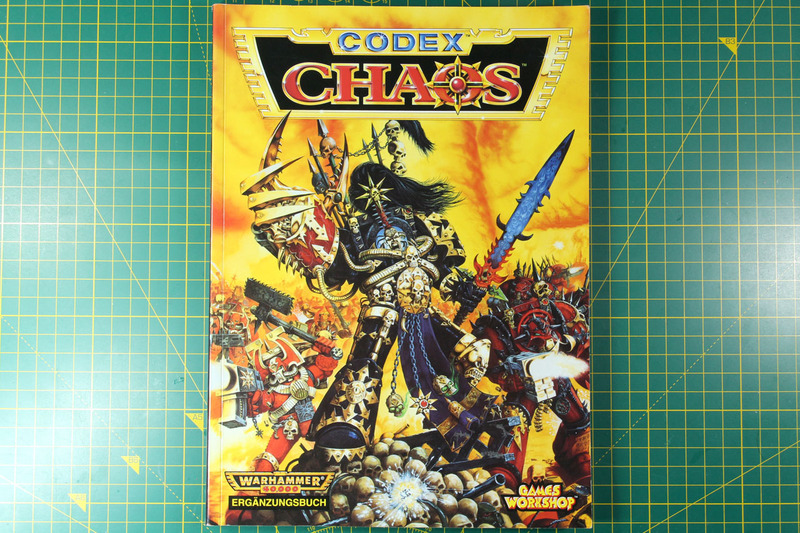 As the champion of the undivided chaos, he made it onto the codex supplement and the artwork was used on the cover of the White Dwarf as well. 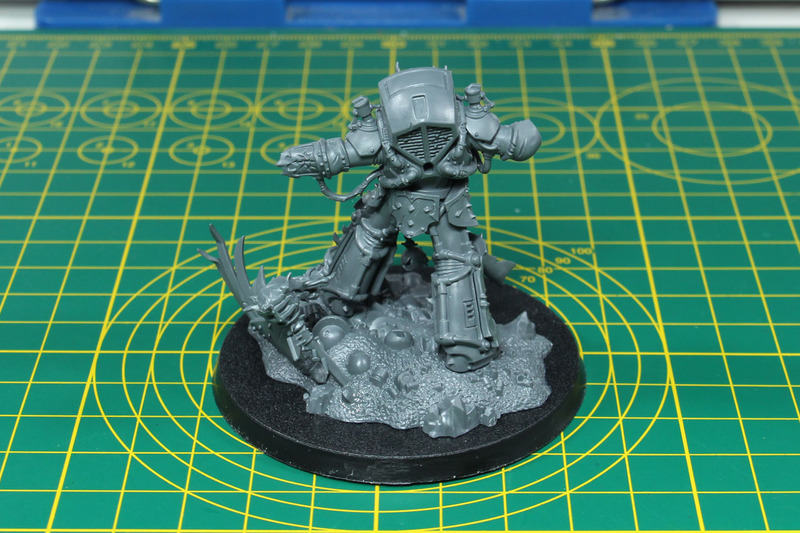 The first model showed Abaddon in his terminator armour, slightly bigger than the regular Chaos Space Marine Terminators. 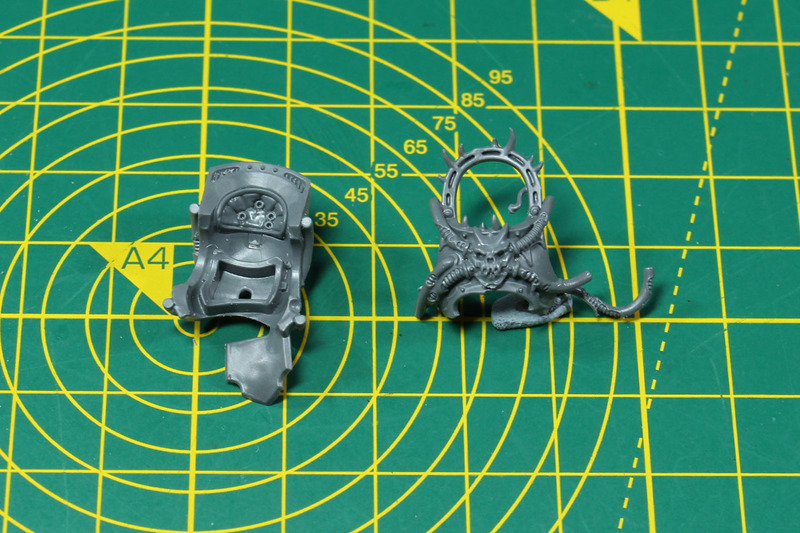 The miniature which was originally a metal cast would later be produced in finecast. 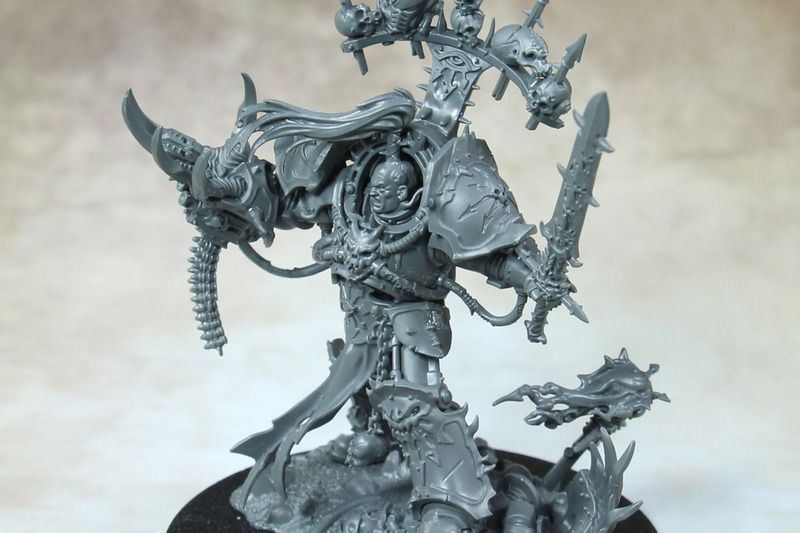 In the early 2000's Forge World took interest in the Warmaster as well and released among their large scale collector series a model of Abaddon as well. A couple of more pictures can be found at hutber.com. And with the Horus Heresy novels the character grew more and more. 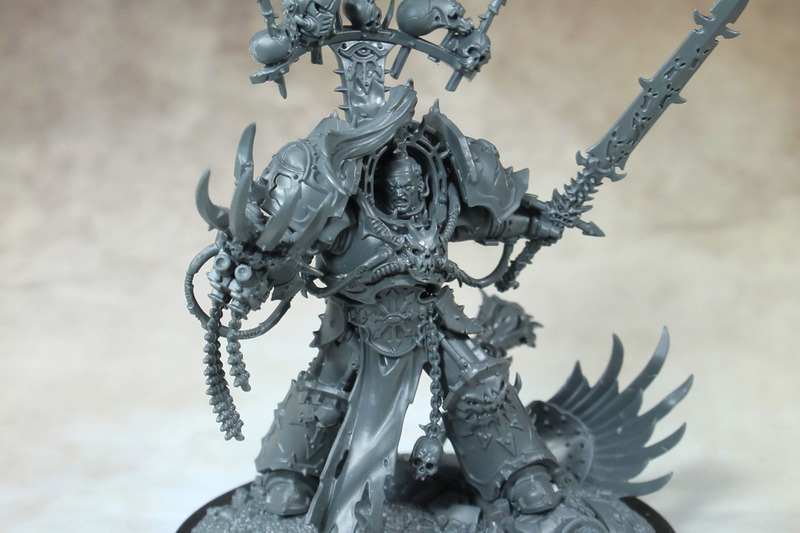 We learned about his service under Horus with the Lunar Wolves, who would later be renamed Sons of Horus in honour of their primarch. But when Horus died, they became the Black Legion. 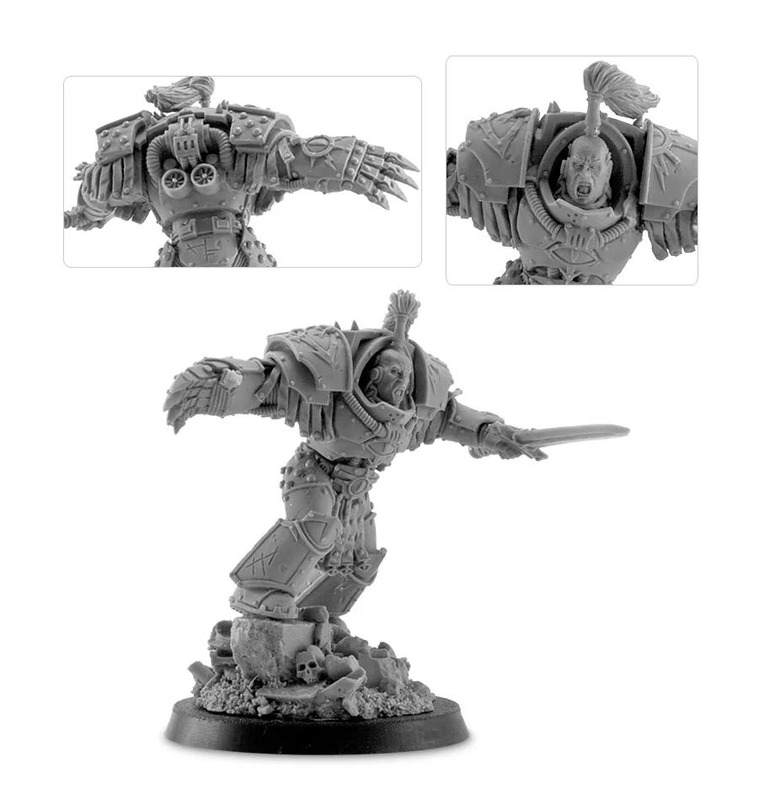 In their Horus Heresy range a duel between Abaddon and Loken available, both in their pre-heresy armour of the Sons of Horus. 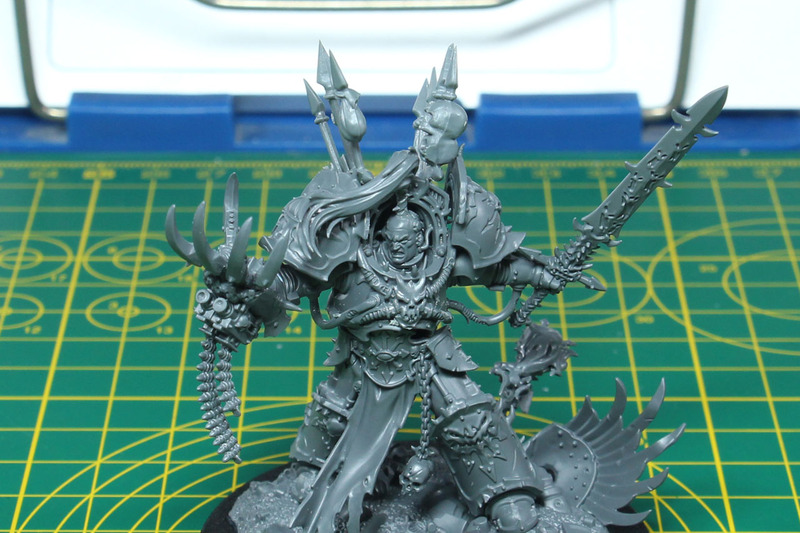 Ezekyle Abaddon was the first captain of the Sons of Horus and Master of the Justaerin, was one of the most renowned and fanatically loyal commanders of the XVIth Legion. 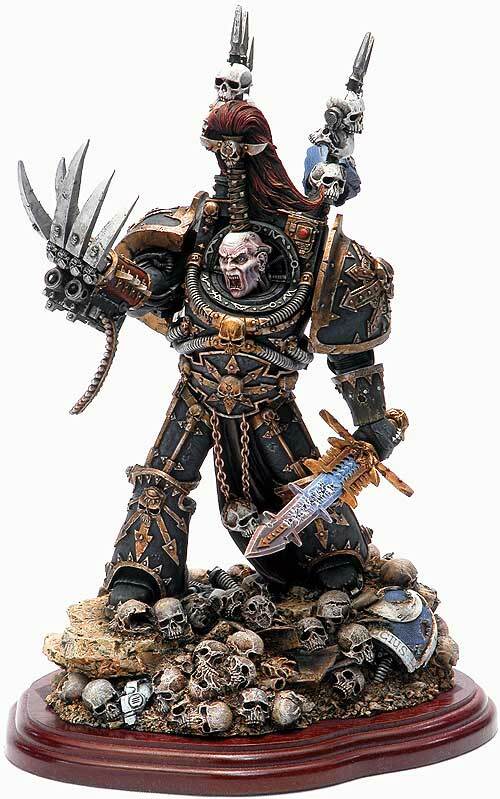 It was rumoured that he was the cloned son of Horus and not "just" a Space Marine with his gene seed. 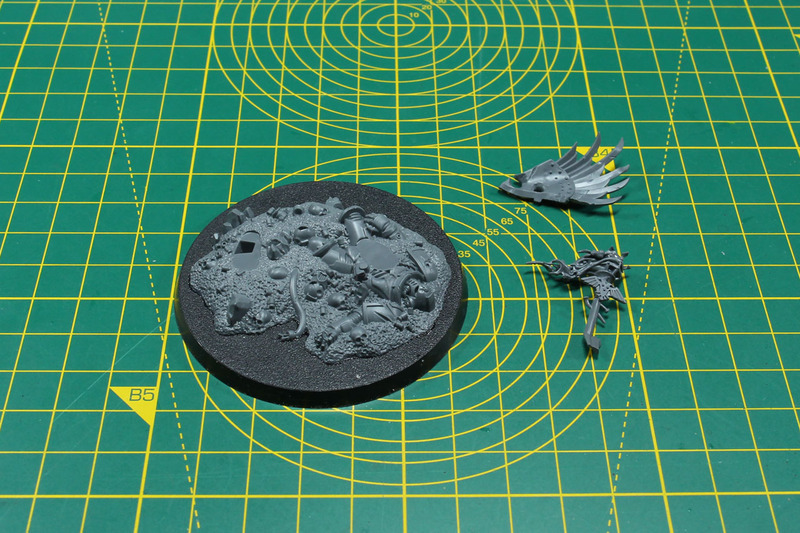 The plastic kit, that I'm showing you today, contains 31 pieces, spread over 2 small sprues, a 60mm base, an instruction leaflet and a small poster. 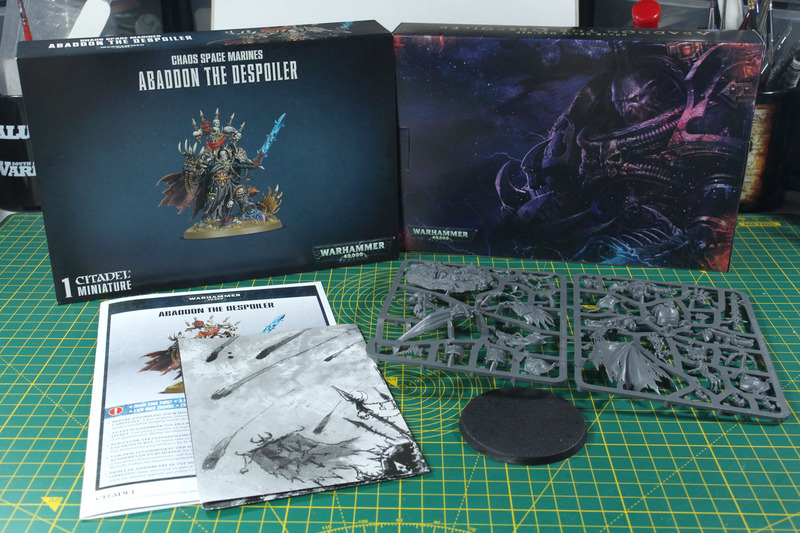 Abaddon is shown here in the current variant, as the post-heresy model, wielding the daemon sword Drach'nyen and the Talon of Horus. 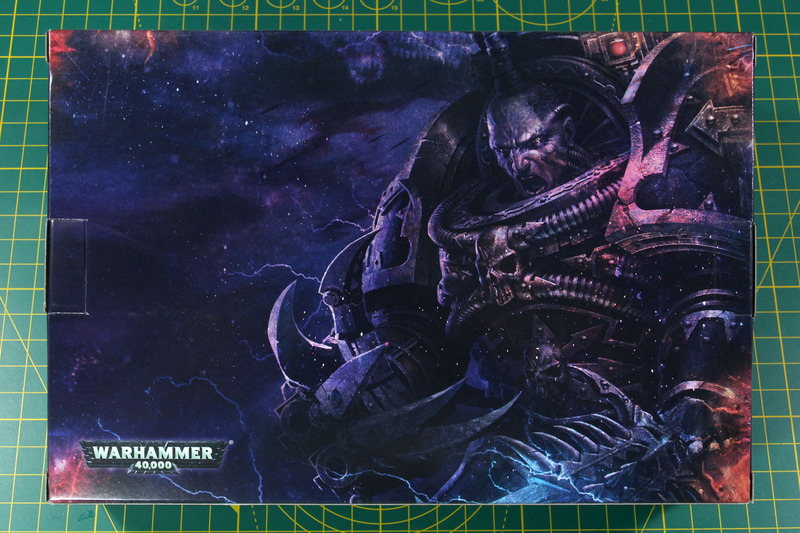 The poster covers the duel between Roboute Guilliman and Abaddon the Despoiler, framed by a couple of loyal and traitor Space Marines. 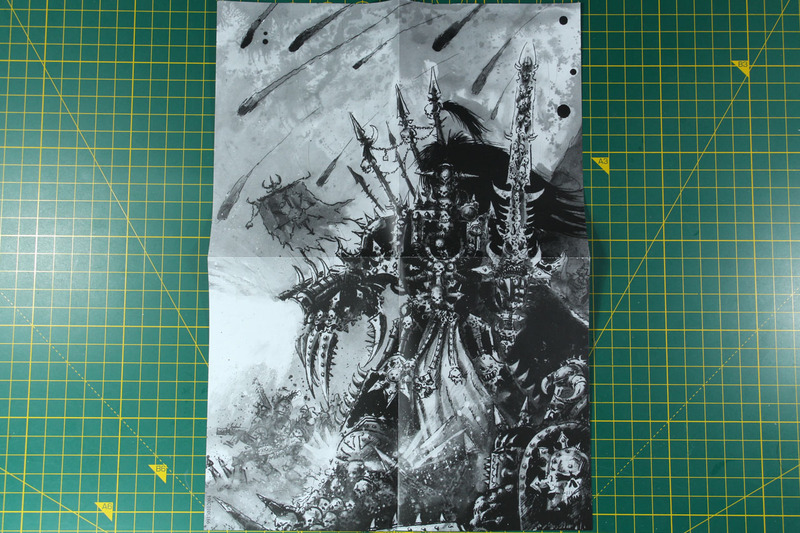 On the back you can see one of the earliest artworks of Abaddon. 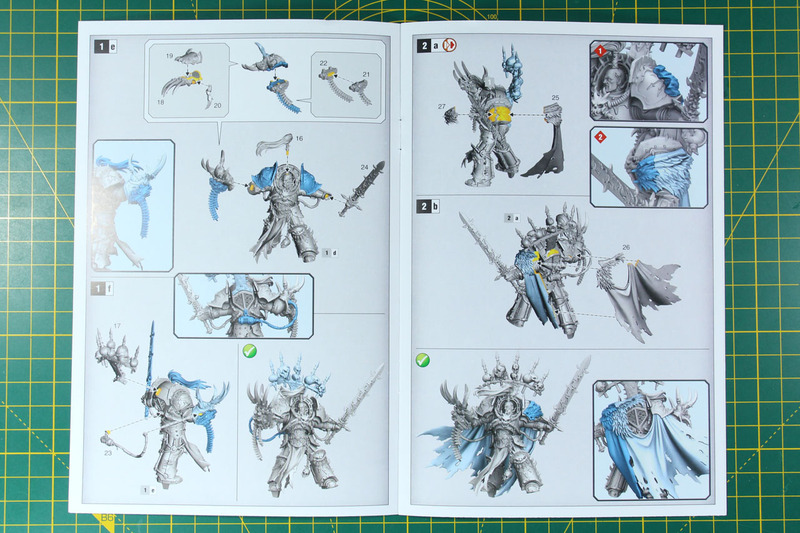 The one that was used on his entry in the 2nd edition codex supplement. 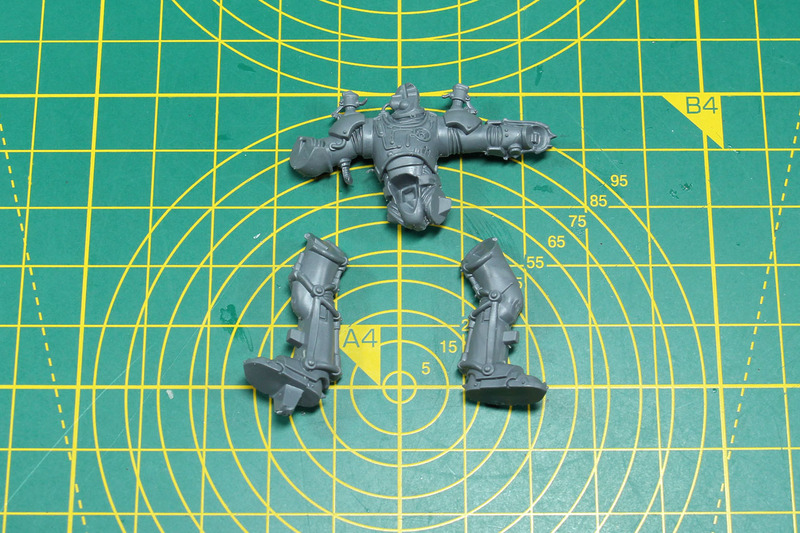 The instructions are quite detailed and contain even the data sheet for the Warmaster in multiple languages. 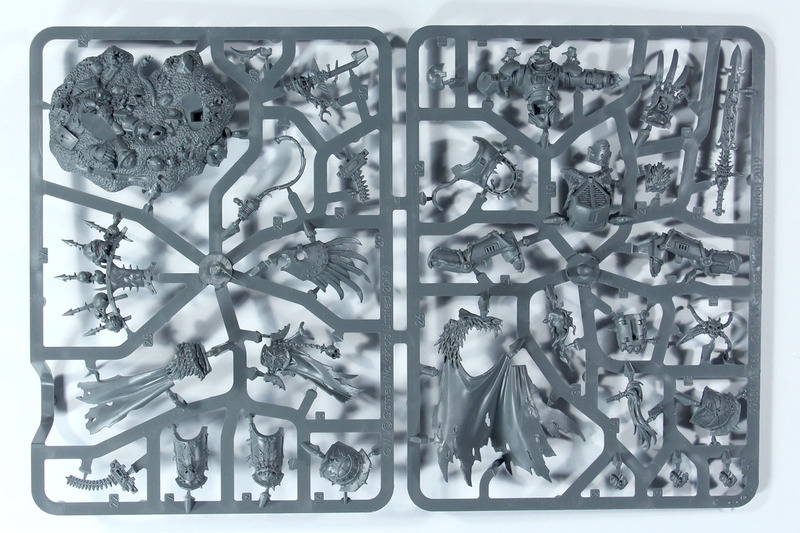 The sprues are very densely packed and the bits and pieces carry a lot details. 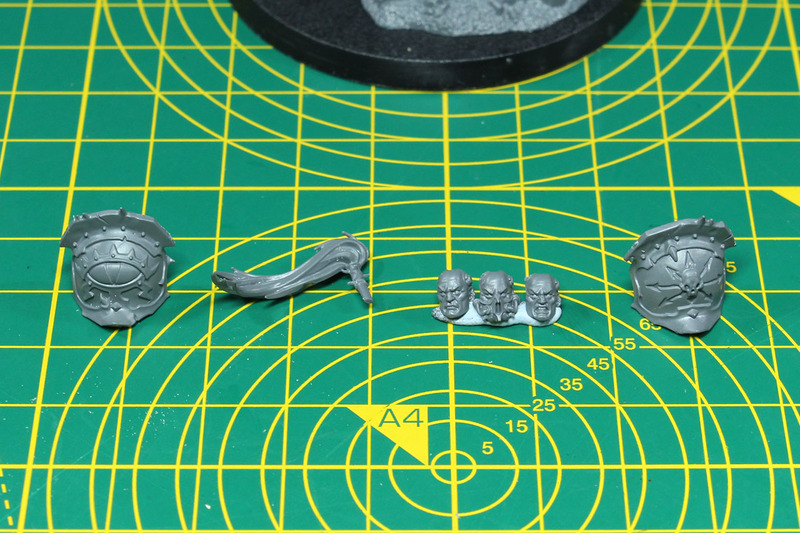 The casting is very crisp and nearly no mould lines are found on the model. 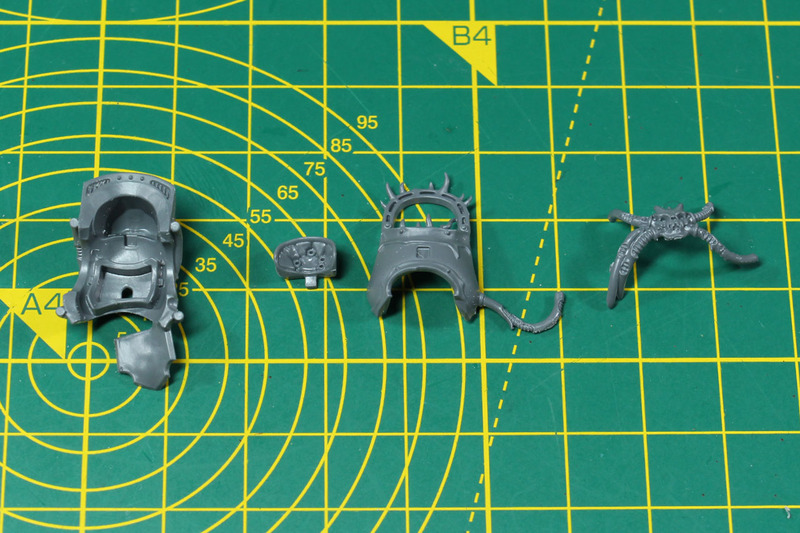 The individual pieces even carry details on parts that won't be seen afterwards, like the inner upper body armour of Abaddon, which reminds me a bit of the suit Darth Vader wears. 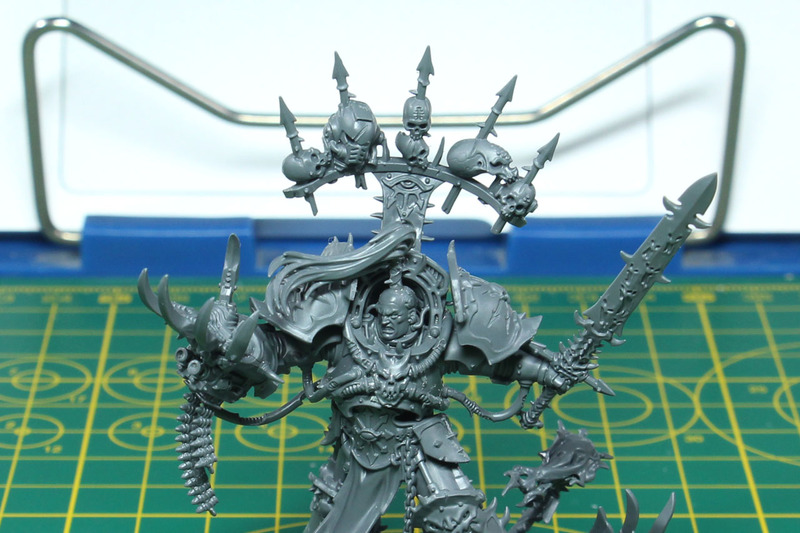 The player can choose between three different heads for Abaddon as well as an optional cloak. 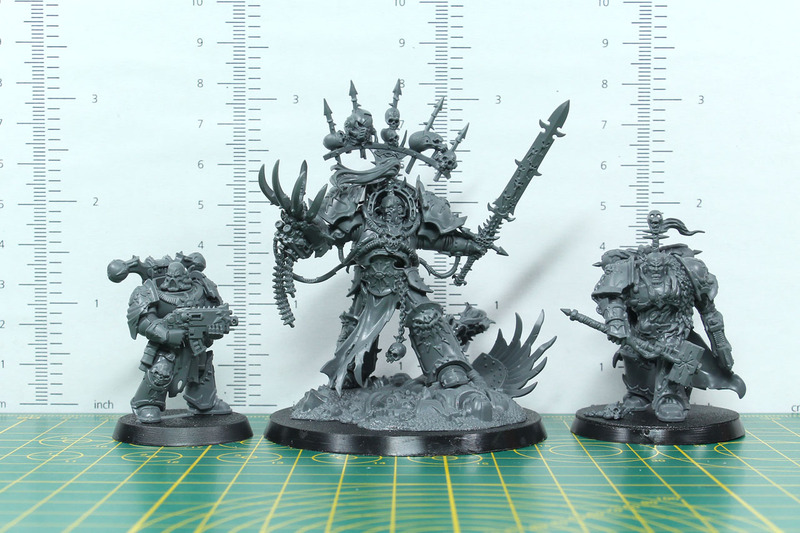 The base sizes for Abaddon have increased dramatically over the years. 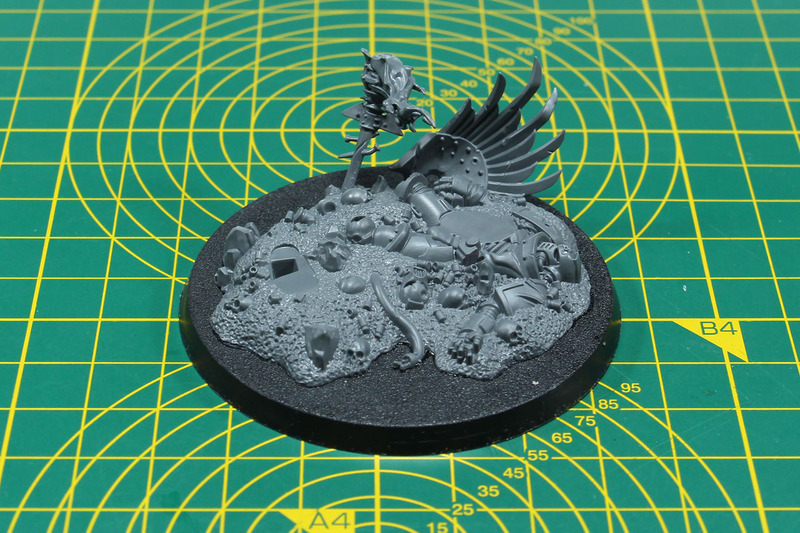 The first Abaddon came on a 25mm round base, was later rebased onto 40mm and now comes with a 60mm round base. 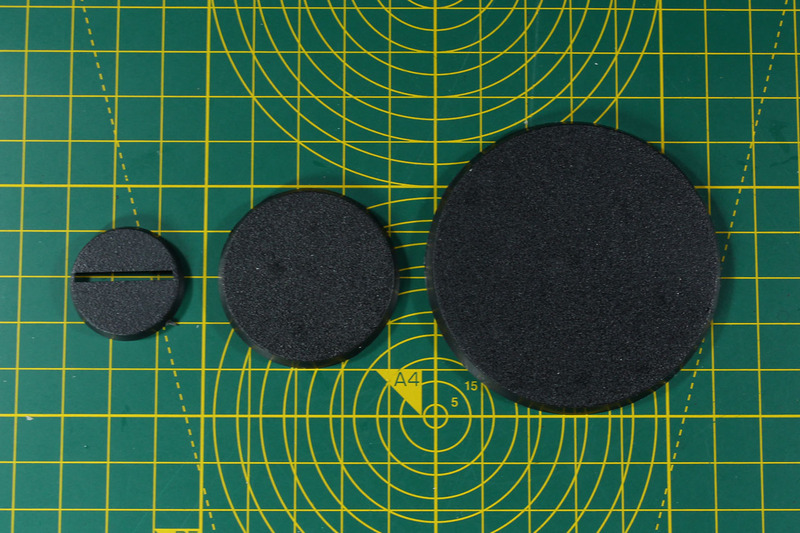 It is a bit strange as Games Workshop declares these bases as 60mm, when they are closer to 65mm in diameter. But let us begin with the build. 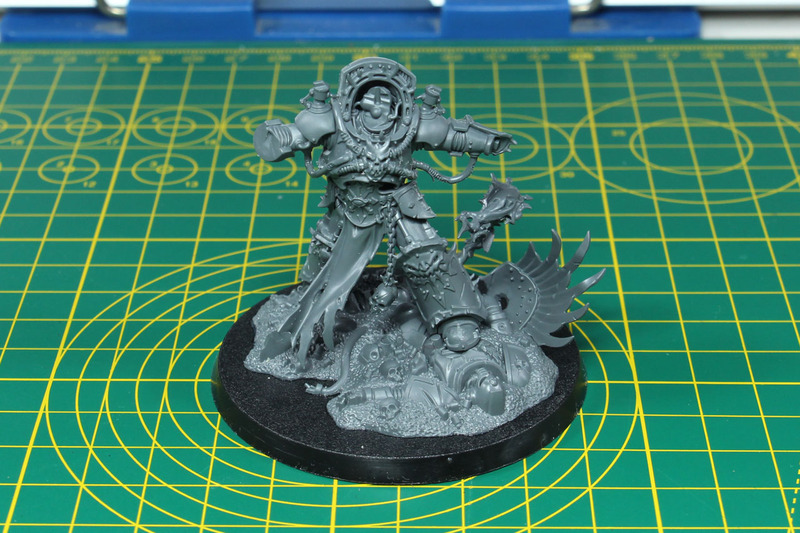 Similar to his loyal "counterpart" Roboute, Abaddon comes with a detailed base. 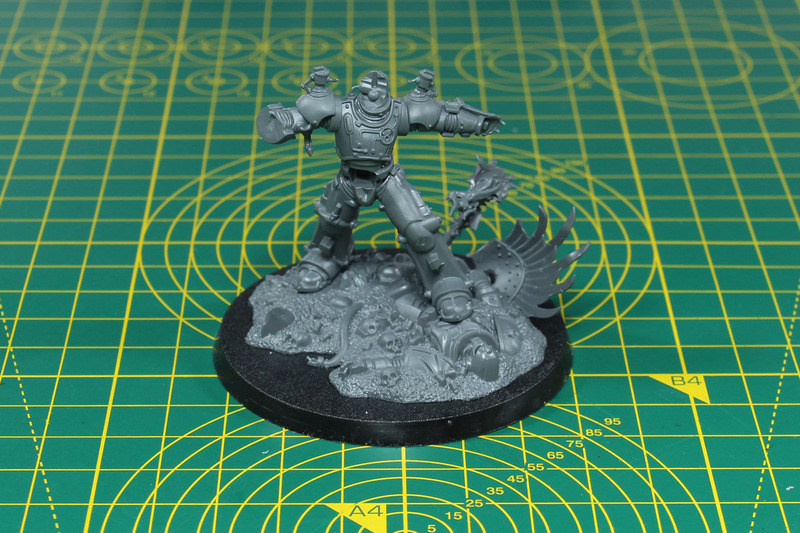 You find a lot of debris, a fallen Primaris Space Marine, wings of an Aquila statue and a burning torch. 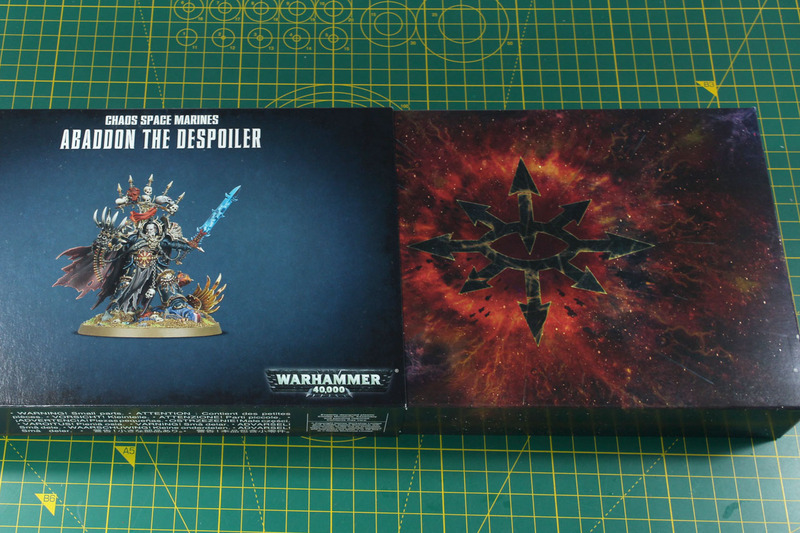 Next up the core body of Abaddon. Consists out of the upper body with arms and the two legs, all without any armour pieces. 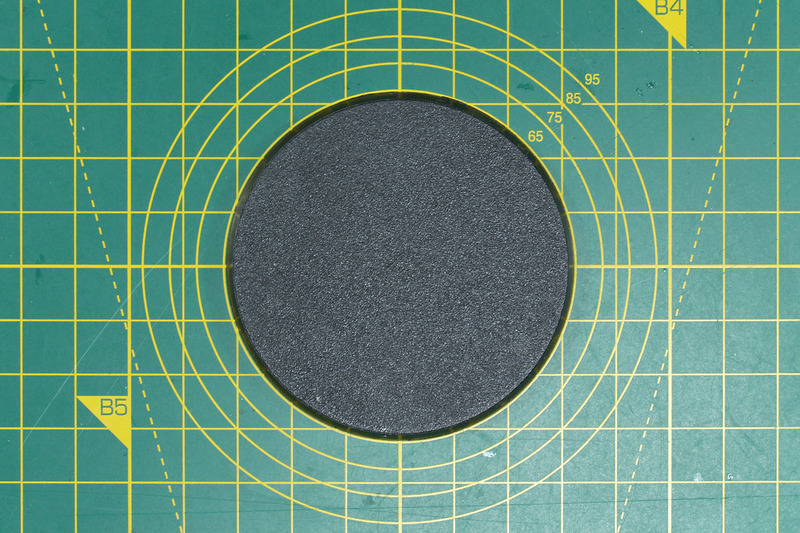 It is interesting to see the design of the base layer. 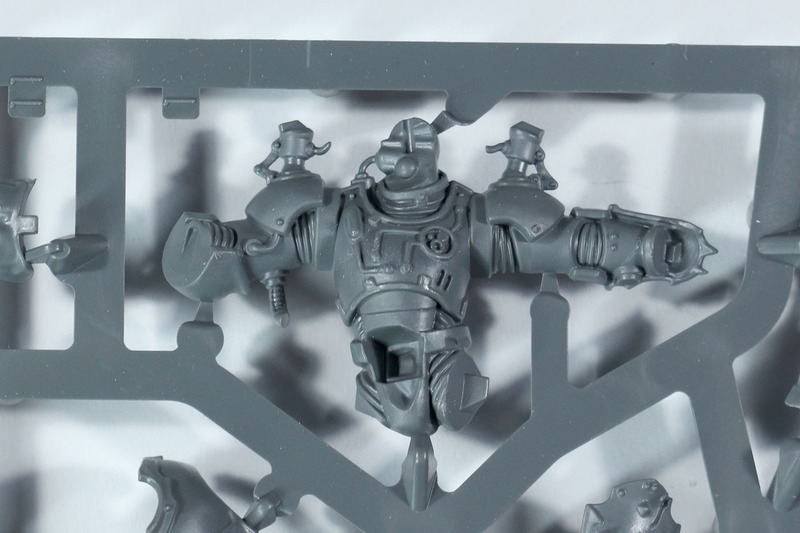 Beside the cables and circuit boards on the upper body, you can see the "pillars" on the shoulders that will later on carry the shoulder pads. Adding the lower armour. The greaves are added and the "belt", along with the tabard. It is interesting to see that they stayed with the original design. There is a daemon face on the left greave, three spikes with skull on the right one and the dominant buckle with the very prominent chaos star. Next up the upper armour. For the cause of more detail depth, these parts are split. The terminator armour as an inlay for the back of the head and the front plate has a more detailed front piece added to it. Fitting design choice that they made the tubes more organic and corrupted. 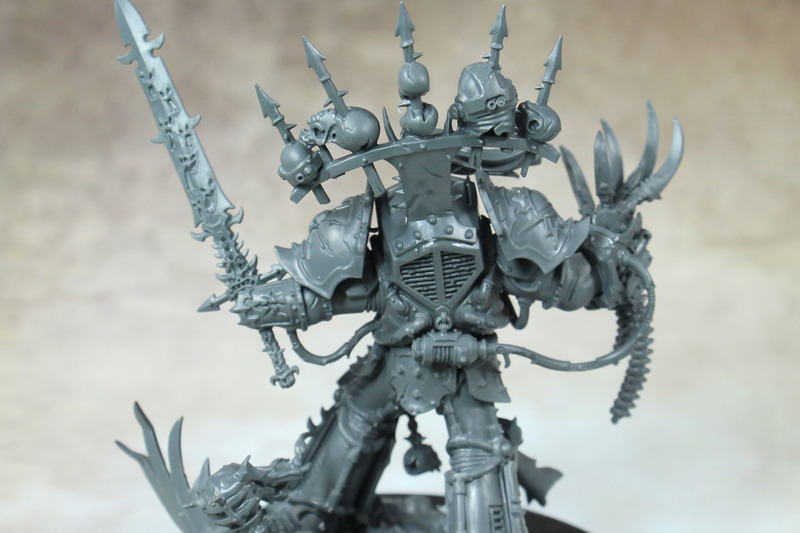 Something you can see on the Black Legion models from Blackstone Fortress as well. 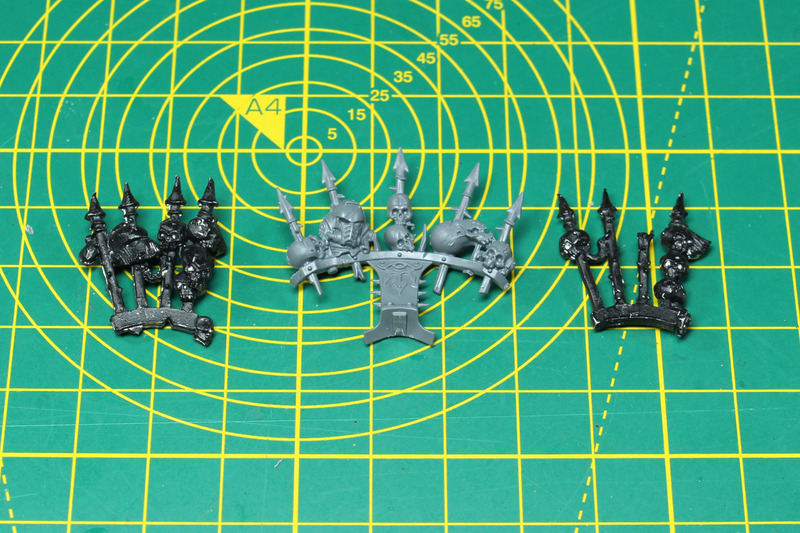 As for the shoulder pads, they carry the Eye of Horus and chaos star, as the old miniature did as well. The iconic braid of course is included, as well as three faces. It is at first a bit strange, that they did only include the faces and not the whole head. But due to the fact, that the braid is pinned from the top, they would have had to include three braids. The faces cover the very Horus like look, a fierce open mouth and one with mask. I went with the teeth showing variant, as it reminds me of the old model. For my taste the braid could be more present or at least taller. The hair itself is well done, just the knot could have been taller and / or topped off with a small skull. 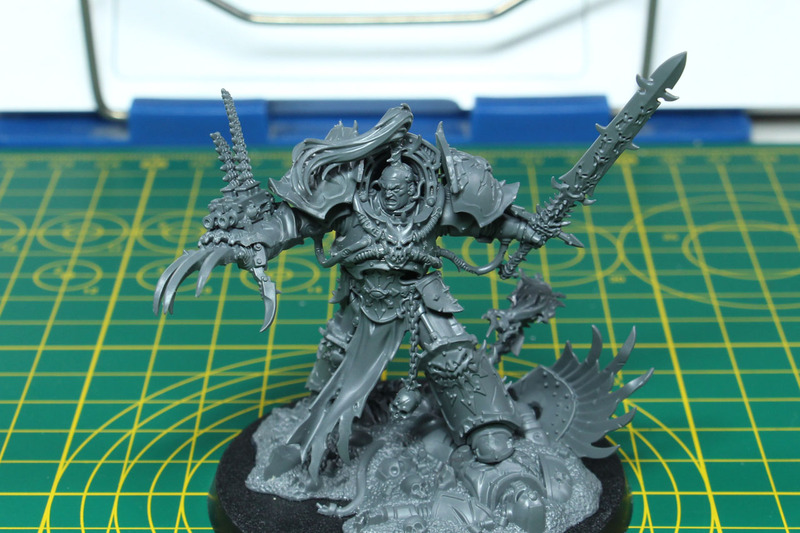 As Lord Commander of the Black Legion Abaddon does not simply carry any weapon into battle. 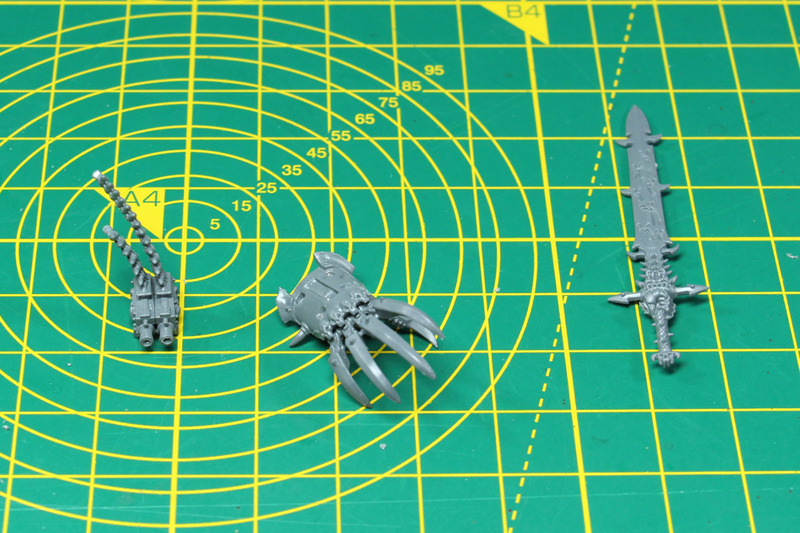 He has the legendary Talon of Horus, a master crafted lightning claw with twin bolters on the back. He took this weapon from the armour of Horus himself, after he fell by the hand of the Emperor. 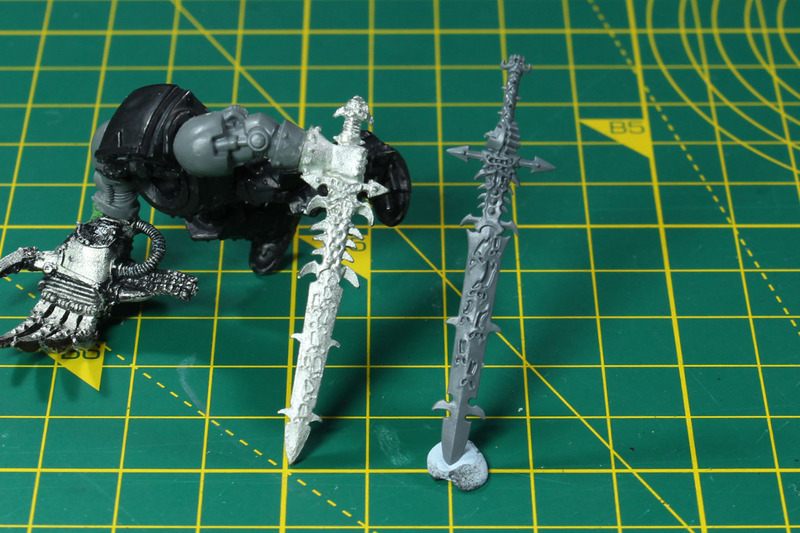 And then there is Drach'nyen, a daemon sword, that Abaddon found during the first black crusade. The design of both weapons is very close to the original ones, but with more details and better proportions. 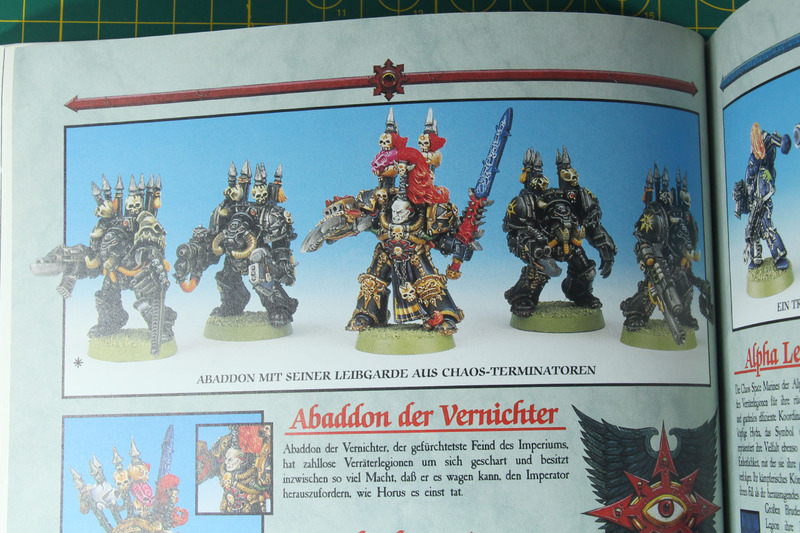 Here you can see them next to the ones from the 90s Abaddon miniature. 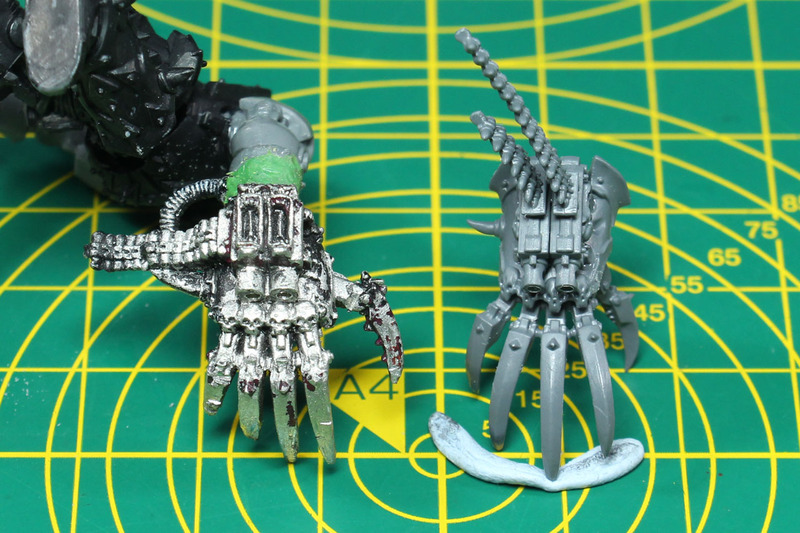 Due to the connection, the claw is meant to be build in a threatening / taunting pose. But with a bit of work, you could turn it upside down as well, as the first picture shows. You would just have to reposition the ammo-belts of the twin bolters. 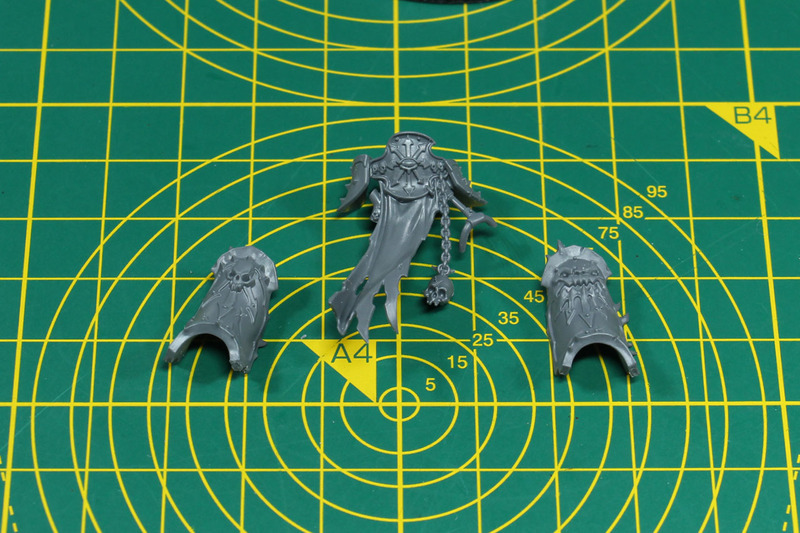 The last main pieces for Abaddon are a connection / power tube for the Talon of Horus and the trophy rack. 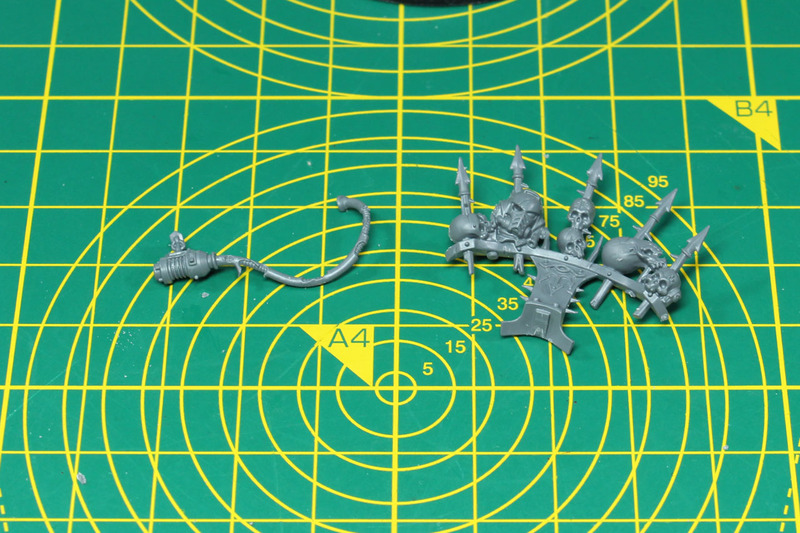 The rack is not like current designs, with two stripes on the left and right (as the Chaos Terminators have since the first models until now, even with the new plastic kit), but a single trophy arch, in a similar design as the new Chaos Space Marines carry their legion / chaos insignia. Another piece as well, where they stayed close to the original design, as the trophy rack covers the space marine helmet and tyranid skull like the very first time. I am not sure, if the "old style", with a rack left and right would look more brutal. 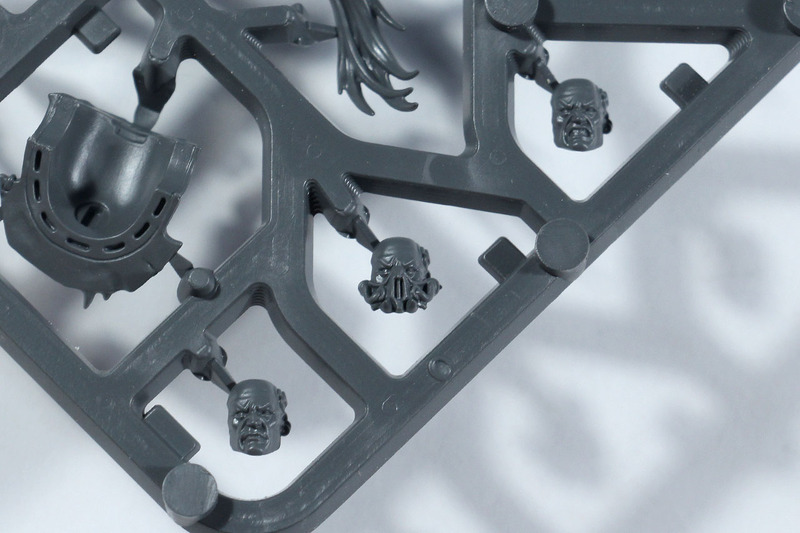 A brief stand in with regular old plastic Terminator racks, you would need something more impressive for the Warmaster himself. And the trophy rack that is included in this kit. 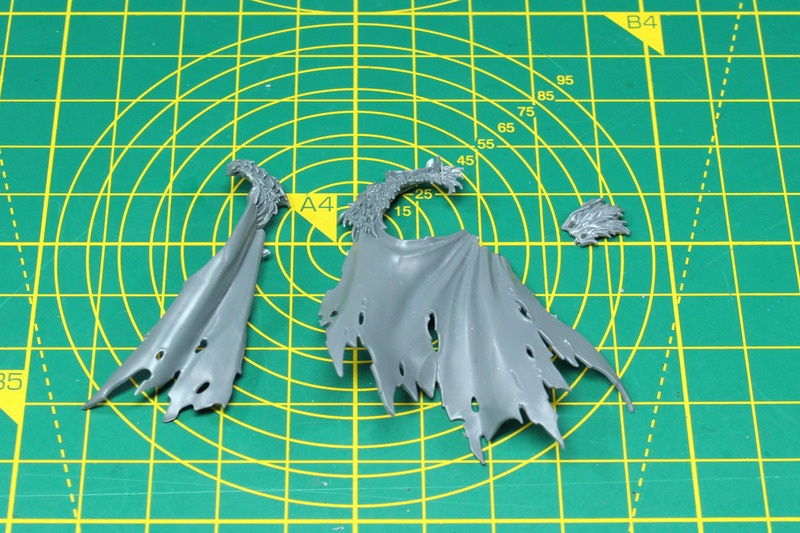 Abaddon would be complete so far, but has an optional cloak with the sprue. From my point of view, this is a must. 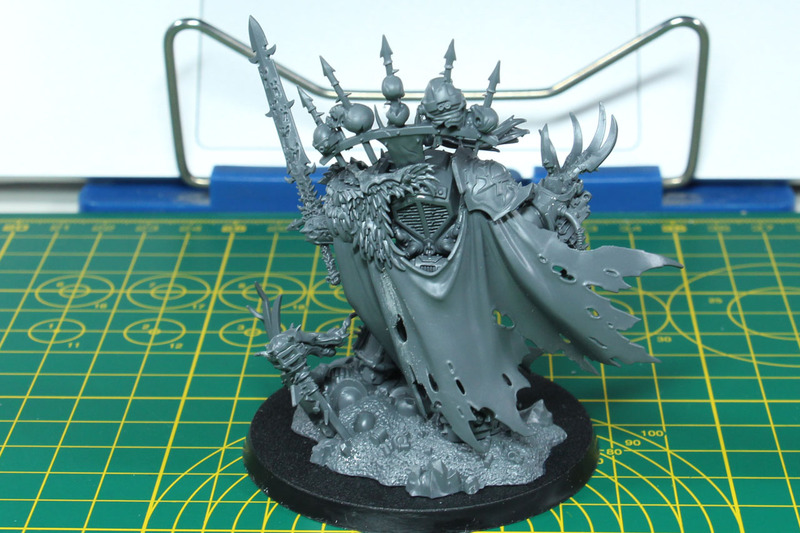 But I'd suggest to leave the cloak off, until you painted the model and add it after that step. 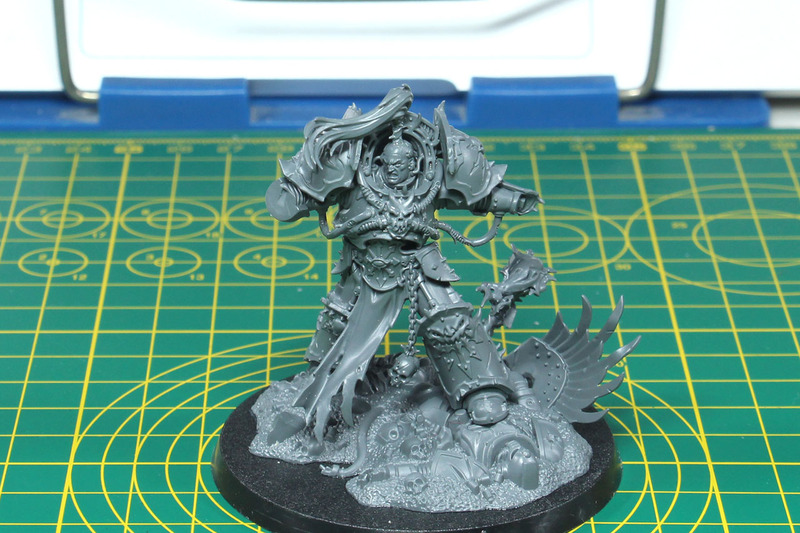 As for the size of Abaddon, I was a bit surprised, that he is almost as tall as Roboute. 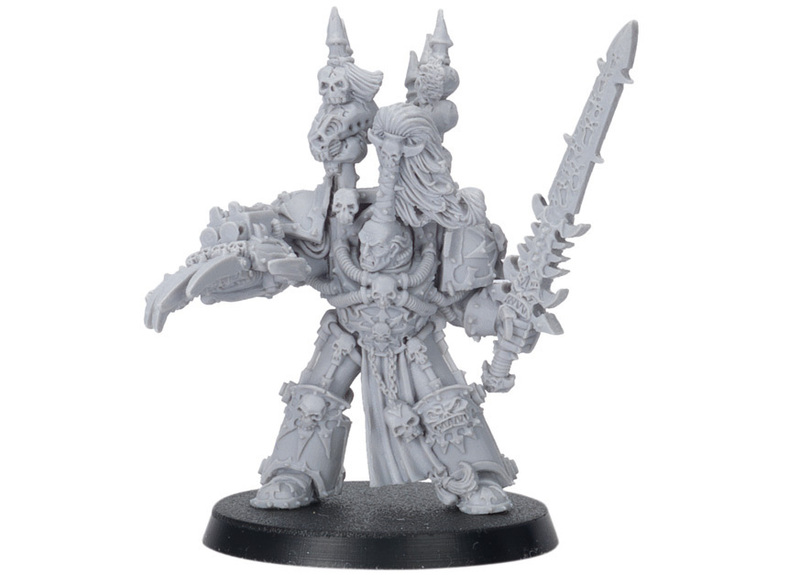 I expected him to be somewhere around the area of the new Marneus Calgar, as both come from the terminator armoured character class, if you will. 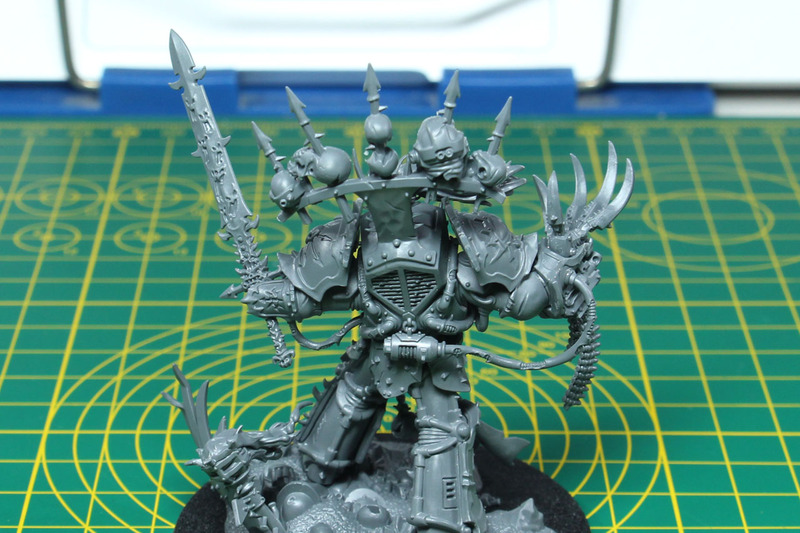 I did a kitbash back in 2009, as the old Abaddon miniature was small even back then, based upon the plastic terminator lord kit. 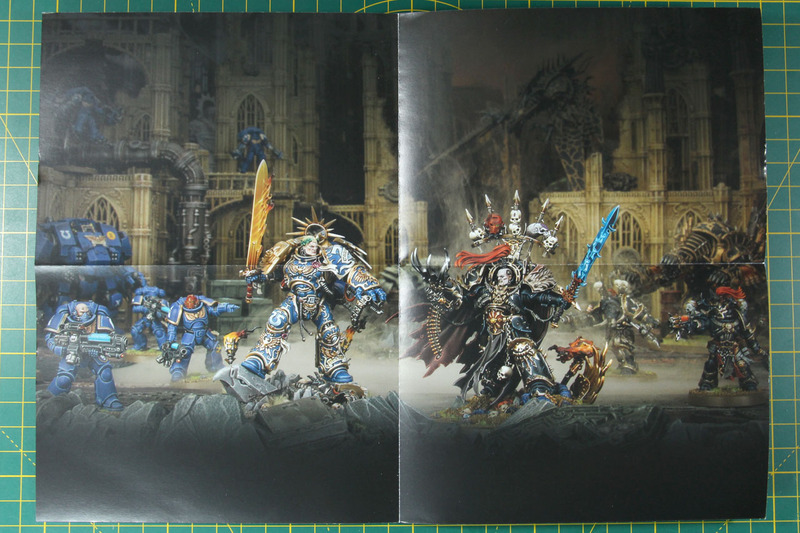 The other two pictures show the comparison with the old original model as well as the Primarch of the Ultramarines. 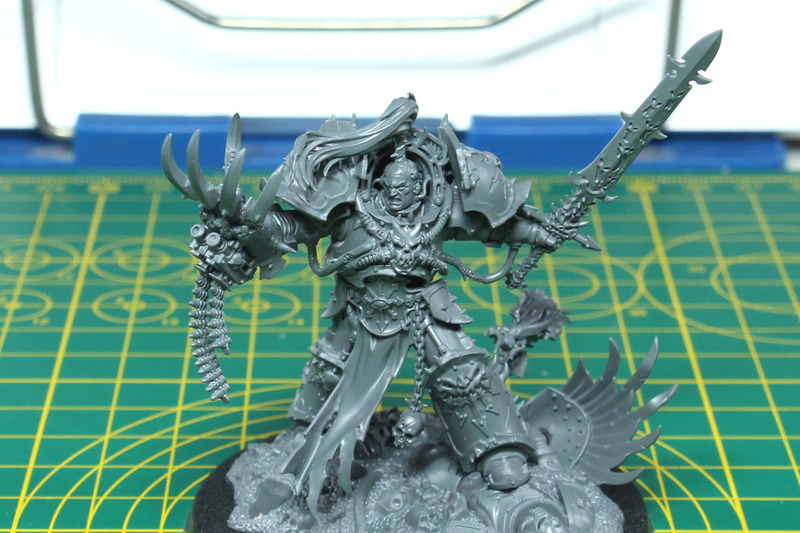 He fits very well with the new(er) Chaos Models and stands out due to his size, very fitting for the Warmaster. 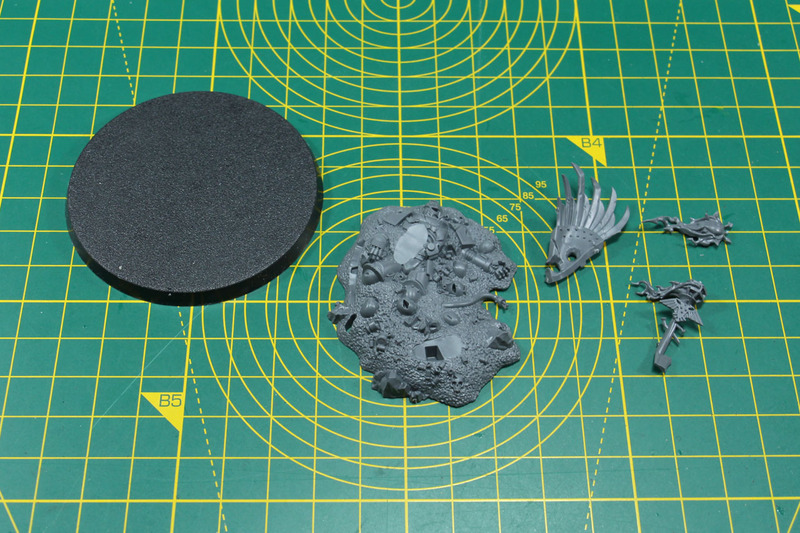 He is almost the size of the plastic daemon prince kit. If you compare the models in the last picture, you see the sheer amount of details the miniatures have nowadays compared to just 10 years back. And some close ups of this impressive miniature. 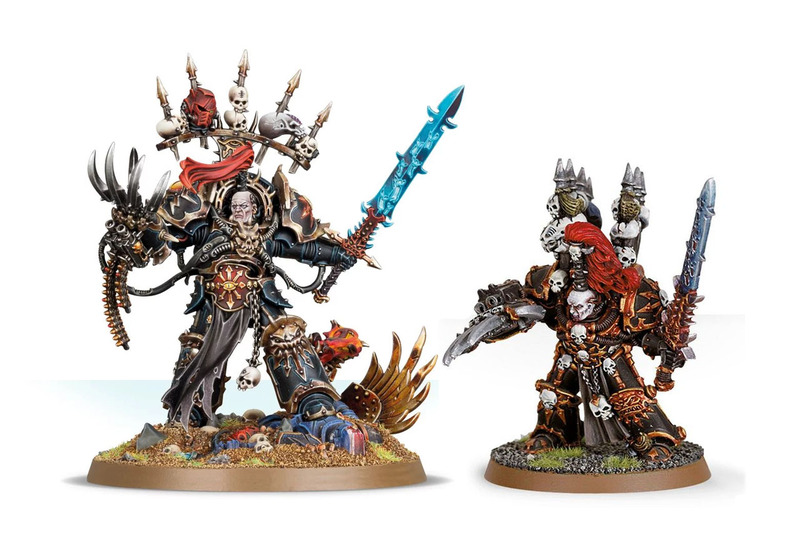 As mentioned further above, it came a bit as a surprise, that they brought Abaddon on eye-to-eye level with an actual primarch. 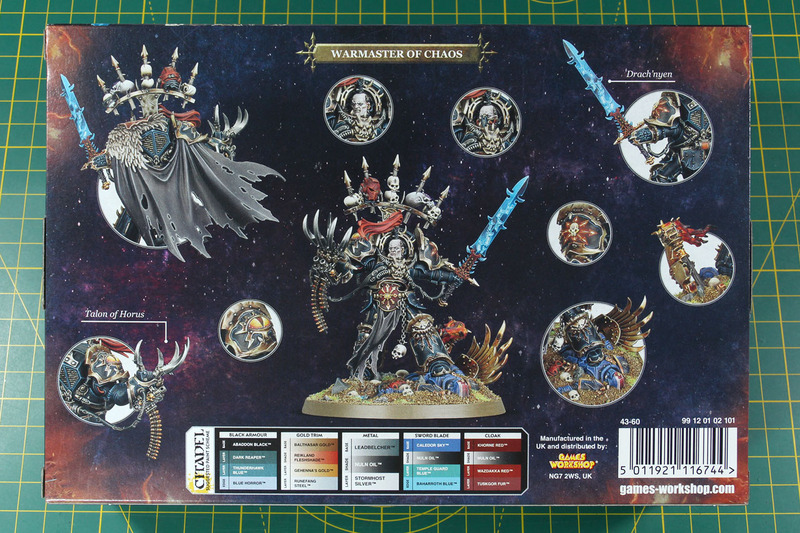 But it makes sense, he is _the_ Warmaster of Chaos. The greatest champion of undivided chaos, bearing the blessing of all four chaos gods. 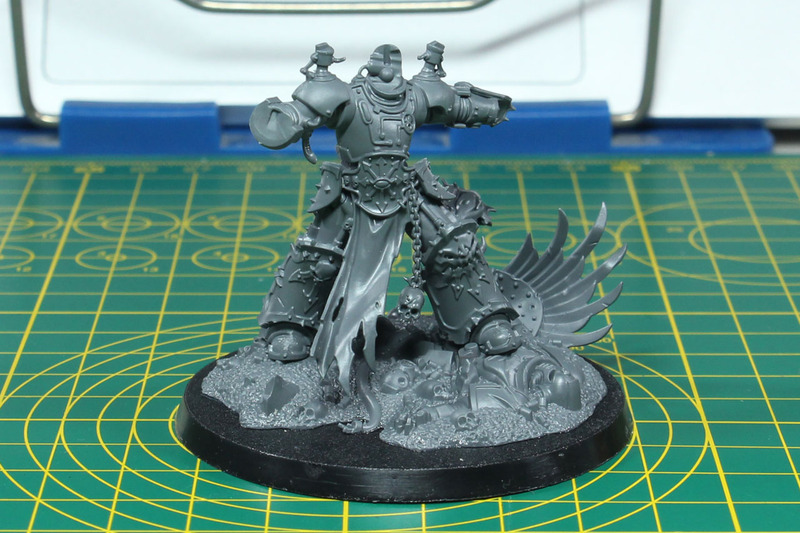 Ezekyle Abaddon was already described as a tall brute during the days of the Horus Heresy, so with the influence of chaos, that certainly didn't change or made him smaller. 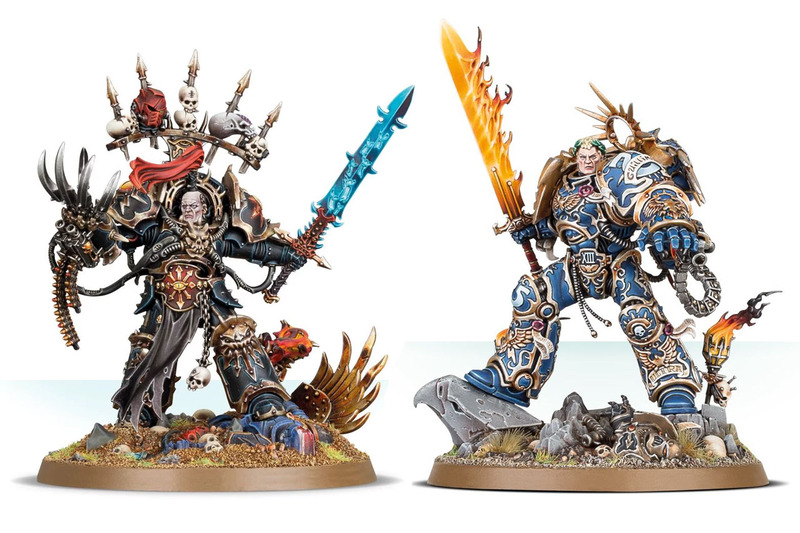 Games Workshop covered the duel like setting between Roboute and Abaddon in a Warhammer Community article - (Im)mortal foes, and goes into detail on the design choices and how they - partially - mirror each other. 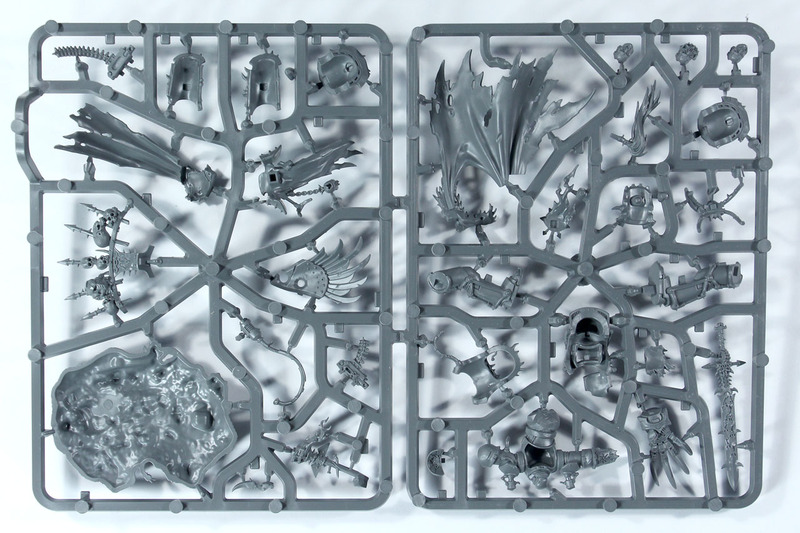 They seem to be very busy introducing the new model, as I've already seen quite a lot of them on several blogs and social media, being painted or converted. At the current moment he is even sold out in the online store. So that seems to worked quite well. 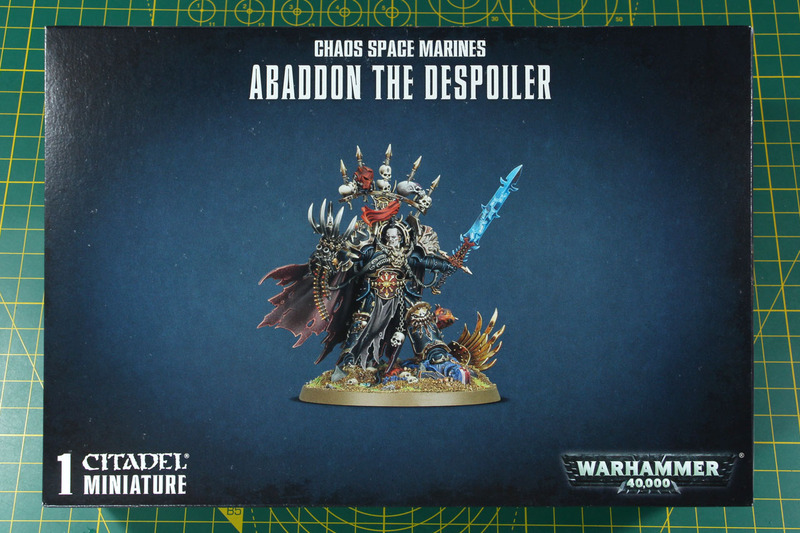 There is already an half an hour painting video for Abaddon by Chris Peach on WarhammerTV. About the price, that he isn't cheap shouldn't wonder anyone. 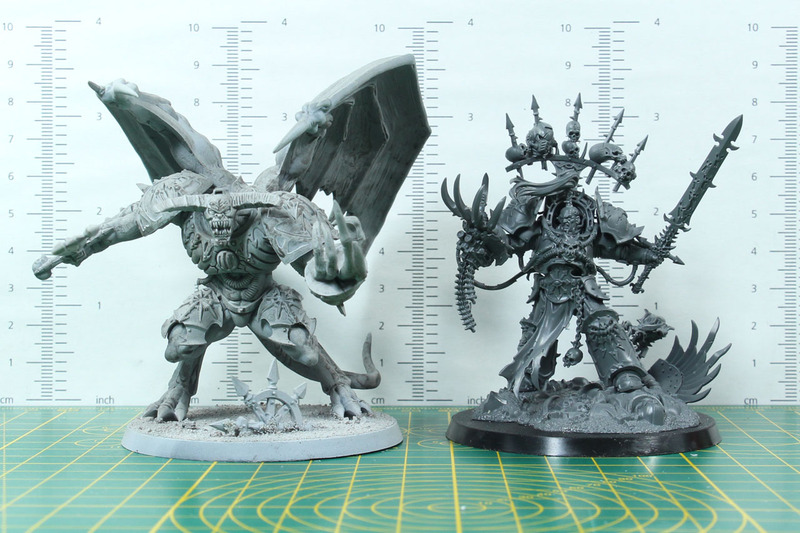 I was interested to see how the size compares to the daemon prince, as the role on the battlefield is somewhat similar (or at least was, Abaddon is more powerful). 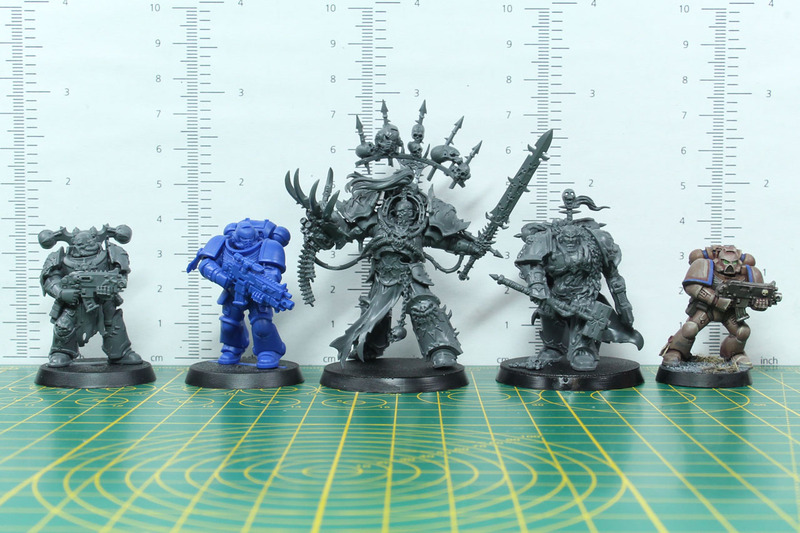 The daemon prince is with 33 EUR quite a lot cheaper, but when I prepared the size comparison, you can clearly see how much and how impressive the design department has developed over the last decade, especially the last five years. The model is just so much more dynamic and offers more detail. Of course, that is due to the shift to single poses / fewer optional parts and variants, that gives the designer more control, but the buyers less options. And that brings me to one of the critic points, that were talked about after the published pre-order. 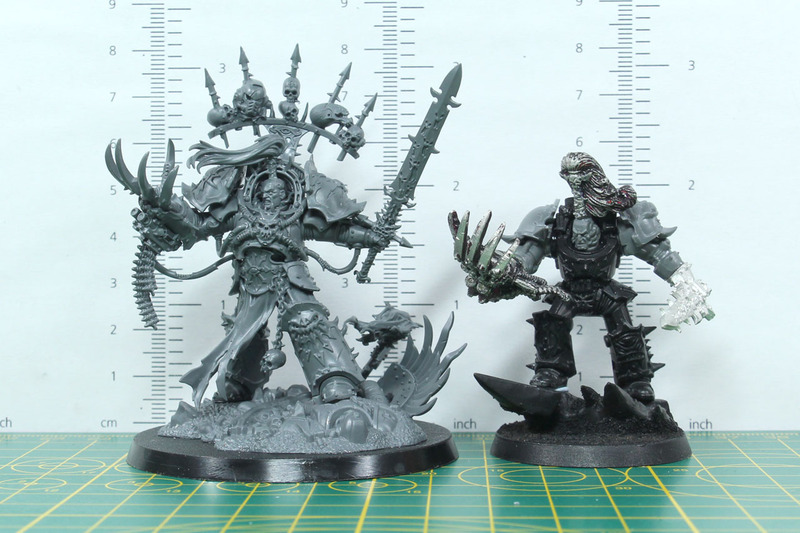 In the pre-coverage Games Workshop talked about how Abaddon would come with three heads, it is actually "just" three faces. 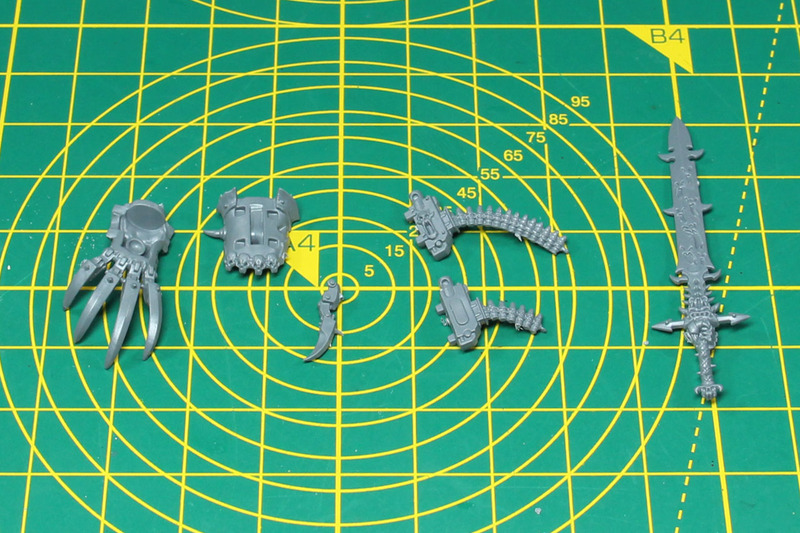 So magnetising them will be a pretty pain in the back. But that was a design choice, due to the hair knot. I would love the knot to be taller, but that will increase the risk of it breaking off and would take of attention from the trophy rack, which I would personally prefer in the old style. Maybe I can manage to get the trophy rack bit a second time and convert them into two rows, left and right on his shoulders. A very pleasant build. Well thought cut of the parts and lovely details. The only thing that is a bit tricky is the cloak, as I didn't want to glue it on just yet, as it will cause trouble during painting. So I'd suggest that you leave that one off until you've painted everything else, if you are not a well experienced painter. 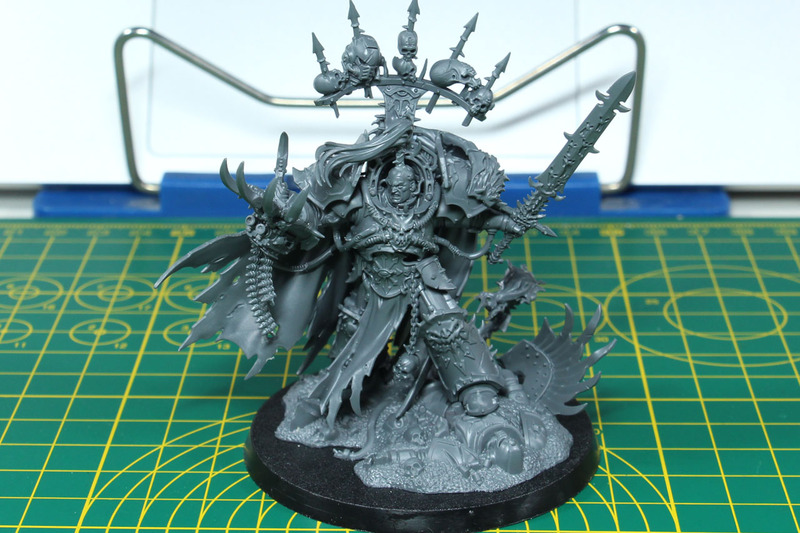 Same goes for Abaddon himself, he fits neatly into the sockets on the base, so you can take him off as you please. Not a massive of the new trophy rack, looks a bit peacockish to me. Think i will add the trophy racks and top knot from the old model for a more classic look. A great in depth review, just what i was waiting for, cheers.